Cartoon photo, a photo by viralbus on Flickr. It might be rather silly, but one of my favourite apps on my Android phone is Cartoon Camera. It does the cartoonification on the fly, so you can move around and look for something that looks good in your chosen style, rather than applying a slow transformation afterwards. 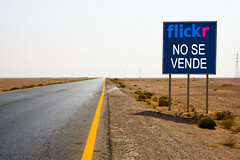 En el Desierto – Flickr NO SE VENDE, a photo by Rocorocks on Flickr. Flickr allows you to connect your WordPress blog, which allows you to use a Flickr photo to illustrate a blog posting by pressing a button. However, Flickr’s standard WordPress code isn’t very good. It encapsulates the whole thing in <div>s, which means that WordPress cannot work out that it’s an image, which leads to all sorts of problems when you’re trying to pull out the first chunk of text from a posting, for instance in an RSS feed. However, if you know what you’re doing, it’s quite easy to change. You need to go to your Flickr settings, and then click on the “Sharing & Extending” tab. You should now see your blog (if it isn’t there, add it by clicking on “More sites” and following the instructions). Now click on the “edit” button next to the name of your blog, and click on “select a blog layout”. Now pick one of the layouts by clicking on it, and then choose “customize”. Now click “preview”. This will look dreadful, because this is WordPress code, not HTML, but just click on “save this layout” anyway. You should now be able to use the “share” button on Flickr to generate pretty WordPress posts. The centre of Glasgow has been transformed into a copy of Philadelphia for the purpose of shooting a Hollywood movie called “World War Z” (starring Brad Pitt). Phyllis and I went down there last Sunday to take a few photos of it. However, when we got home, I tried to compare it to photos of the same places in real Philly, and I must say I find it hard to see the similarity. I guess the film’s producers must be counting on very few people actually knowing what Philadelphia looks like! Phyllis sent in a few photos to an Oxfam competition, and the result was a lengthy article in the Evening Times today. A photo of a Glasgow chip shop menu is among images of the city which have been made into postcards. Tourists will be able to send friends and family the quirky image, which was one of the winners of a competition run by Oxfam. It is one of four new Glasgow postcards which will go on sale at the Oxfam Bookshop in Royal Exchange Square. 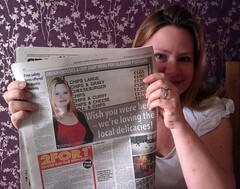 The chip-shop picture was taken by Phyllis Buchanan, 43, from Newton Mearns and bosses had more than 200 entries. Phyllis, who compiles dictionaries, said: “I took it in West Nile Street. The reason I submitted it is my husband’s Danish, my ex-husband’s French, and the one thing that seems to unite foreigners when they come visit is the dreadful things we eat. I thought foreigners would like to send a postcard like that. My maternal grandfather, Otto Nielsen, was a keen photographer, and he also recorded the family on 8 mm film from 1973 till around 1978, when he had to stop due to illness. However, going from the original film strip to YouTube has not been all that straightforward. After his death, his 8 mm films were lying around in a drawer in my grandmother’s flat, mixed up with some films he must have bought at some point. After quite a few years, my grandmother finally got round to viewing them all with a view to throwing away the ones he hadn’t made himself, and she took the remaining ones up to a shop where they converted them to VHS, added some easy-listening music and discarded the original films. This week I then bought a kit to connect our VHS recorder to my Windows 7 computer, which creates an MPEG file. I then loaded this file into iMovie on my Mac (which was a bit tricky, because iMovie won’t admit that it likes MPEG, so I had to create a MP_ROOT folder at the root level of my USB key and create a folder called “101PNV01” inside this folder and put my MPEG files inside this [thanks!]). From then on, it was easy – iMovie is great for editing films and putting them onto YouTube. The Photoshop Disasters blog is one of those sites that can be mediocre for a while, but then they post something so wonderful that you know you’ll keep following them forever. I don’t think I should really comment on this photo – there’s really nothing I can add. However, in general I must admit I simply don’t understand why so many photos get photoshopped. Surely the original would have been better? Author thomasPosted on 2009/10/28 Categories en, IT, photography1 Comment on Is this iPhoto?